I been grooving on Liquid Barn's White Chocolate Peppermint as a single flavor since it came out for the holiday. It is really, really good. Got bored and threw this one together and have been alternating it into my rotation of bored mixes. Enjoy. Just a tasty thick easy recipe. I shake and vape, it of course gets better over time. Fantastic and simple recipe. I love creamy vanilla peppermint! I added a half a percent of FA Peppermint and it helps carry it through the steep a little more. Now I know what to do with that huge bottle of LB WCP. Really enjoying this mix. 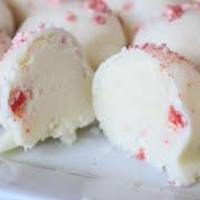 A bangin' Peppermint Ice Cream. Thanks Fear, great job! This recipe is freaking amazing! The flavor balance is perfect and you get a nice refreshing mouth feel as well. Love it! Perfect. I don't like cold vapes really but this one is delicious. Even as a shake and vape it's delicious as a much more smooth WCP without the scratchiness. I'm sure it will be even better after the weeks steep.